I have one of those wax warmers in my classroom, and a drawer full of scented wax cubes. We have a new scent every week, and my room “smelling so good” is one of the quirky things my students like and remember about my class. I should be earning some sort of commission on all the wax warmer sales that are a direct result of my classroom atmosphere… but I digress. The reason I’m bringing this up is because the names of the wax cube scents are always so… fancy. Sure, the cube smells like a “dryer sheet”, but it’s called “Faded Denim“. It’s a stretch to say a cube of wax smells like “pumpkin”. Even so, it’s called “Enchanted Pumpkin Valley“. Sometimes, it’s all how you name it. It’s all how you frame it. And… it’s about whether that naming and framing gets student buy-in… beyond buying wax warmers… I’m talking about buying into the math now. Today, for example, we explored patterns between squaring stuff and taking square roots, and attempted to describe and define what a “perfect square” is, and what a “square root” is. 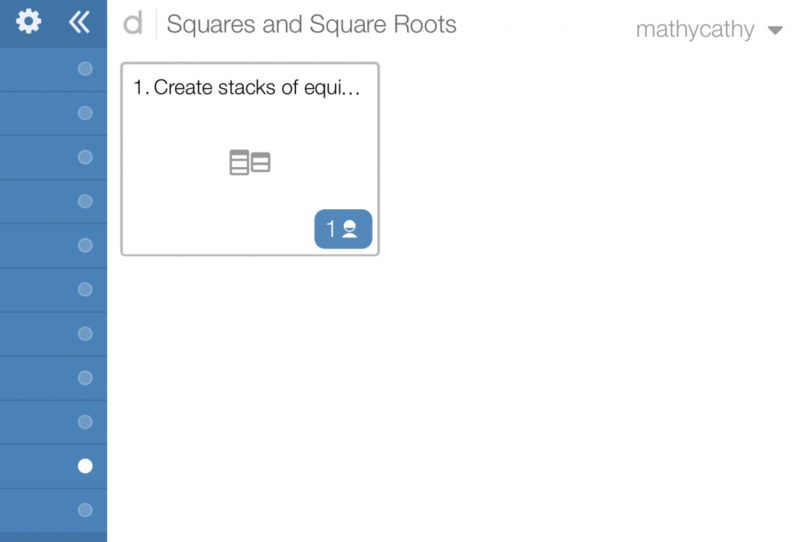 After messing around with numbers, drawing squares, writing ideas in our own words, and even using calculators a bit, I gave students a Desmos Card Sort to try. (1) Students join the activity using the code, and I set a timer for a specific number of minutes (depending on the task). During this time, the teacher dashboard is projected on my smart board, but there is no feedback. Students have to silently and individually comprehend and begin the task. (2) After the minutes have passed, I reveal the feedback screen from the teacher dashboard, so students can see lots of “red” and “green”. The catch is, all students must remain anonymous at first (thank you Desmos for making this so novel and fun with your famous list of mathy names). (3) I scroll through this feedback screen and circulate as students are working, talking in teams, and making changes to their card sorts. 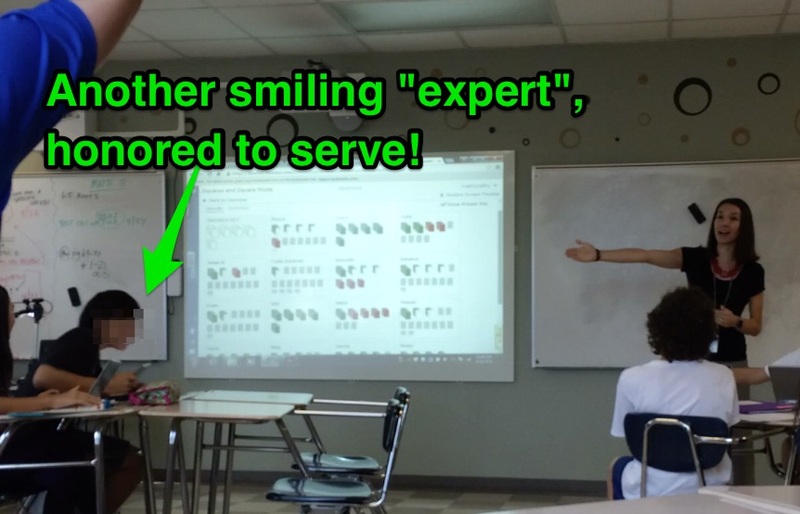 All the while, they’re looking back and forth from their screens to the smart board, to figure out which card sort is theirs, and whether or not the changes they’re making in real time result in more “green” or “red”. (4) At this point they are beyond desperate for feedback. They are begging me to reveal their actual names. I promise to do this only after I’ve received my first “expert”. I’m looking for the first student whose stacks are entirely green. This increases the energy and the collaboration in the room, because everyone. wants. to. know. which. stack. is. their. own. (5) When the first “expert” emerges, it’s a celebration! 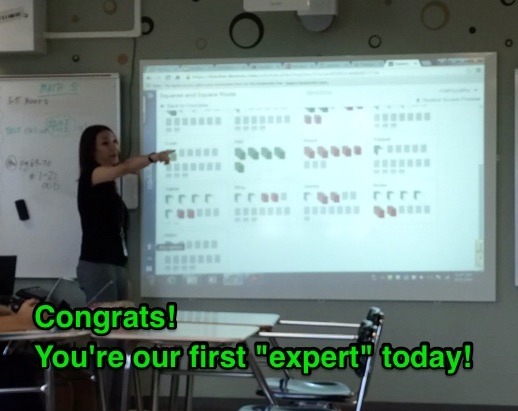 We find out who that expert is, and everyone else’s names are revealed next to their stacks too. The “expert” is immediately “up for hire”. That means students who just found out they have a boatload of red cards can request that the “expert” come to help them. (6) From here, it becomes a beautiful blur. Students continue to earn “expert” status and become “up for hire”, popping out of their seats to help a bud. 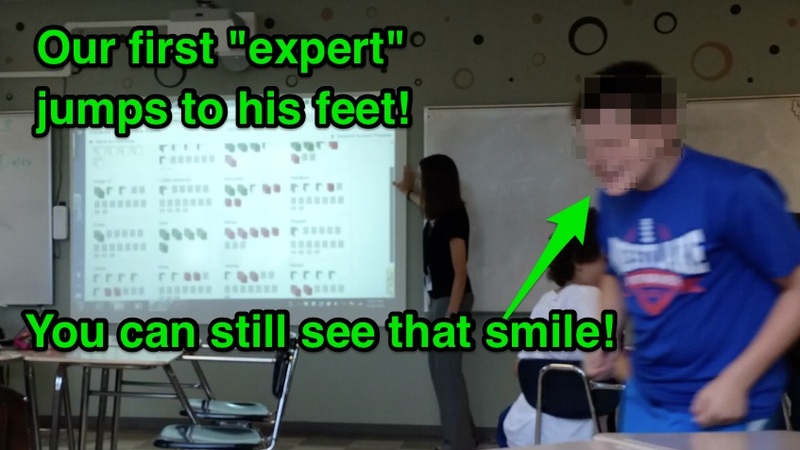 At one point today, every struggling student had a proud one-on-one expert tutor, and I just stood there, scrolling through the teacher dashboard, with a silly grin on my face. It’s all how you name it. It’s all how you frame it. P.S. Images captured thanks to my iPhone’s time-lapse feature. This entry was posted in Algebra 1, Pre-Algebra and tagged #MTBoS, Dan Meyer, Desmos, error analysis, mathycathy. Bookmark the permalink. Thanks for the post Cathy! While reading your post, I found myself contrasting my experience with students getting stuff wrong. I work in a high-achieving school and many of my students are pretty high strung about getting things wrong. It takes me months in Geometry to get these kids comfortable presenting partial ideas or just making shoot-from-the-hip attempts at problems. I never quite get there in Algebra 1. All that to say, revealing student names of students floundering might get me a parent phone call. I completely agree it’s all in how you frame the situation. How do you personally help the students see this is about improvement rather than labeling a student as “slow”. However, kids are kids everywhere! And mistake-making happens in math everywhere as a part of learning it well. I’ve found success through starting the year with talks about mindset, and trying my best to be a transparent and imperfect teacher. Let’s face it – we all make mistakes in math, and part of learning math is making mistakes and then fixing them. I’m blessed to have iPads for every student, so tapping into student thinking is a very efficient, daily occurrence. When I’m looking closely at a lot of student thinking on a regular basis, mistakes are going to happen. How we handle them, day to day, has shaped class culture tremendously. I literally have a sign on my classroom wall (to quote Jo Boaler) that says Mistakes are Expected, Respected, Inspected, Corrected. I point to that sign while teaching all the time, and have shared this message with parents too. You say you “might” get a parent phone call… could that be a grand opportunity to educate parents and families about how mistake-making and correcting these mistakes is a part of learning math? I like the idea of having students take a look at anonymous work and making a decision as to whether to the work is correct or incorrect and why. I don’t have a one-to-one iPad classroom but I can easily take pictures of the student work and then start a class period analyzing it together. It’s now on the to-do list. Sounds like you’re off to a great start, Andrew! Would love to hear how things go! Do you have advice on learning to use Desmos better? I have created activities for my classroom and then I see what others have done and I feel like there is so much more I need to learn. Thank you so much for posting this! 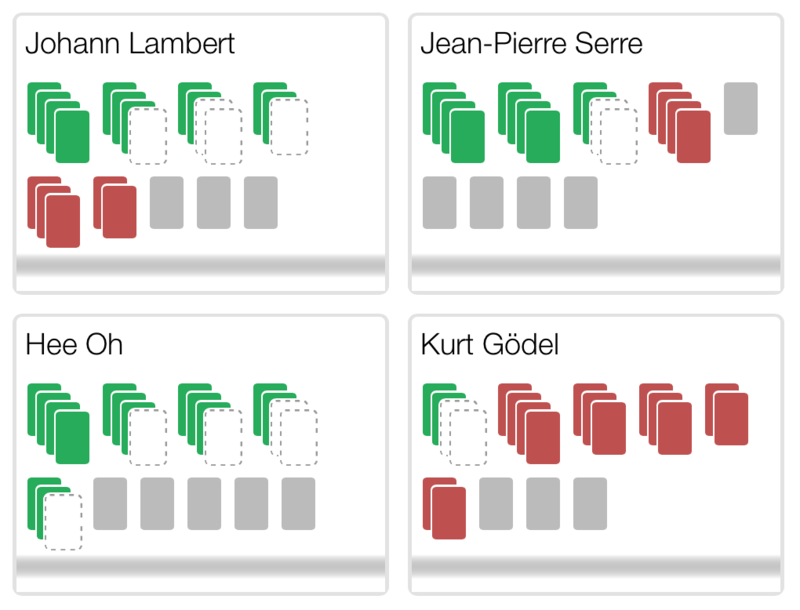 I did my first Desmos card sort last week and did not fully think through how I was planning on getting all students to finish off the card sort. When they got to the point where they had matched everything they could and had them mostly correct but one or two red stacks, many of my students tried to just blindly guess and check, moving cards around. That ended up taking a really long time and not helping them learn anything about the content of the sort. Love the “expert” idea, this will solve my problem next time I do a card sort! Fantastic! I’d love to hear how it goes!